Explore the outdoors, Vegas style! Vegas is famous for its glittering lights and buzzing Strip – but Vegas’ natural landscape can’t be overlooked. The gorgeous desert foliage and red-hued rocks of Nevada create the perfect opportunities for outdoor activities in Las Vegas. The first step in exploring the outdoors in this desert landscape is knowing where to start. Here are some of the most underestimated spots for outdoor exploration in and around Las Vegas. Mount Charleston offers idyllic landscapes and gorgeous scenery that can only be experienced in the desert. Located in Spring Mountains National Recreation Area, Mount Charleston is widely known for offering some of the best views, hiking opportunities, and outdoor activities in Las Vegas. Each season brings with it new offerings on Mount Charleston, with winter and spring attracting skiers and snowboarders and summer and fall alluring hikers, trail runners, and mountain bikers. Las Vegas locals will tell you that Lake Mead National Recreation Area is a must-see outdoor adventure. Known as one of America’s most diverse recreation areas, Lake Mead boasts opportunities to boat, hike, cycle, camp, fish, and beyond. Outdoor enthusiasts won’t be able to get enough of this year-round playground. Explore the Historic Railroad Trail or sit and relax at a tranquil marina. Between the canyons, valleys, mountains, and lakes, a visit to Lake Mead Recreation Area won’t disappoint. If you like to mix the outdoors with old west history, Bonnie Springs Ranch is the place for you. What was originally a stopover for travelers to California has become a charming escape for Nevada visitors and residents. Bonnie Springs Ranch is located in Red Rock Canyon and claims that it’s the “best kept secret”. Immerse yourself in the area’s history with horseback rides, tours, and an old western dining experience at the ranch restaurant. What better way to explore the outdoors than in the largest wildlife refuge outside of Alaska? Desert National Wildlife Complex protects six major mountain ranges and countless plants and animals. Visitors that explore here will be greeted with stunning views, unique rock formations, and thriving ecosystems. Places to see include Corn Creek, Alamo Road, and Mormon Well Road. For 680 acres of lush foliage and active wildlife, pay a visit to Floyd Lamb Park. The park is backed by gorgeous views of the Sheep and Spring Mountain ranges, making it a great place to hike, picnic, or simply take a peaceful walk with loved ones. Explore the outdoors and get a feel for the area’s origins by visiting Floyd Lamb Ranch, where you can learn about the early Las Vegas lifestyle. Summers provide views of lush greens, while fall blankets the landscape in brilliant golden hues. Perfect for Mojave desert explorers of all levels, the River Mountains Loop Trail offers paved trail options and beautiful views. The 34 miles of trails weave around the River Mountains, which connect the Hoover Dam, Henderson, Boulder City, and the Lake Mead National Recreation Area. The ease of the trails makes it easy for the entire family to explore together, making it one of the most inclusive outdoor activities in Las Vegas. Make sure to familiarize yourself with the trailhead map beforehand so you can plan your outing accordingly. Visit the place that started it all – the Hoover Dam. The city of Las Vegas began to grow as a result of Hoover Dam construction workers seeking recreation and relaxation, making visiting the Hoover Dam a fun and unique way to celebrate Vegas’s beginnings and explore the great outdoors at the same time. Enjoy the beautiful Nevada waters by whitewater rafting, fishing, and swimming and enjoy the local wildlife by camping and hiking. Teeming with life and lush with natural beauty, the area is just waiting to be explored. The bright lights and excitement of Las Vegas are part of what make it the enticing oasis in the desert that it is. But sometimes getting back to nature can provide the break from the pandemonium that we need. Luckily, Las Vegas is surrounded by some of the most scenic landscapes in the country. From picturesque parks to clear blue lakes to mountain view hikes, exploring the outdoors desert style never ceases to impress. Be sure to get out and explore another side to Las Vegas on your next visit to Club de Soleil. 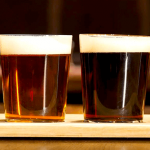 OctoBEER: Where to find craft beer in Las Vegas!